Background: Ever-changing perception of beauty from childhood to old age is changing with the revolution in cosmeceuticals science. Esthetics is an individual's perception since time immemorial. Standards of beauty have changed through centuries with increased awareness about esthetics. The face remains main source of information for identification and discrimination. It constitutes a structural ground for many nonverbal messages including the emotional state of a person, so the proverb “Face is an index of mind” holds good. The wrinkles and laxity are considered to be one of the factors for aging. Hence, escalating demand for cosmetic treatment to reduce facial wrinkles and laxity has stimulated us to search for published literature for nonsurgical techniques for enhancement of facial beauty. The review analyzed the published data to provide narrative basic review in a concise way to the beginners, clinicians, and students. Materials and Methods: We have adopted search criteria using keywords: Botox, Botulinum toxin, incobotulinumtoxinA, esthetics, face, uses of Botox, with various Boolean operators and or in title, and abstract using PubMed search engine. The database search limited to PubMed only from January 2013 to June 2018. Results: Various search results have been appended as annexures at the end of the article for further reference for the readers. Finally, 17 references were selected to write narrative review to meet our objectives. Conclusion: The advancing front in the use of toxins is an emerging science for the beautification of a face. Botox exploded in to market because of efficacy, tolerability, and minimally invasive nature. The present review gives brief about the history of Botulinum toxin, types, mechanism of action, clinical indications, preparations, storage, and technique for various uses with a brief note on patient selection, contraindications, and complications. Ever-changing perception of beauty from childhood to old age is changing with the revolution in cosmeceuticals science. Esthetics is an individual's perception since time immemorial. Standards of beauty have changed through centuries with increased awareness about esthetics. The youthfulness despite advancing age includes smooth, charming skin without skin folds, volume loss, and skin laxity. According to Ayurveda aging is defined as “to become old by the act of wearing out” which is a synonym for “Vardhakya.” Aging is an inevitable biological process, in which both intrinsic and extrinsic determinants led progressively to a loss of structural integrity and physiological function. The desire to look younger and in turn, vital has been a lure to humanity for ancient times, though aging remains as a rule and a fact of life. The face remains main source of information for identification and discrimination. It constitutes a structural ground for many nonverbal messages including the emotional state of a person, so the proverb “Face is an index of mind” holds good. The wrinkles and laxity are considered to be one of the factors for aging. The wrinkles in hyperfunctional muscles sometimes may be misinterpreted, when these types of habitual repeated contraction accompanied by a lack of shortening of skin which will produce a wrinkle. The pursuit of youth and beauty has undergone a resurgence of interest as evidenced by increased visits of people to cosmetology clinics. The field of esthetics is expanding with advances in the area of facial rejuvenation. In the present era, multiplicity of lasers to cosmeceuticals and other innovations are complemented to the armamentarium of cosmetologist. The limitations and strength of these various tools must be understood by the physician and the patient; so that one can tailor the most effective treatment plan appropriately. 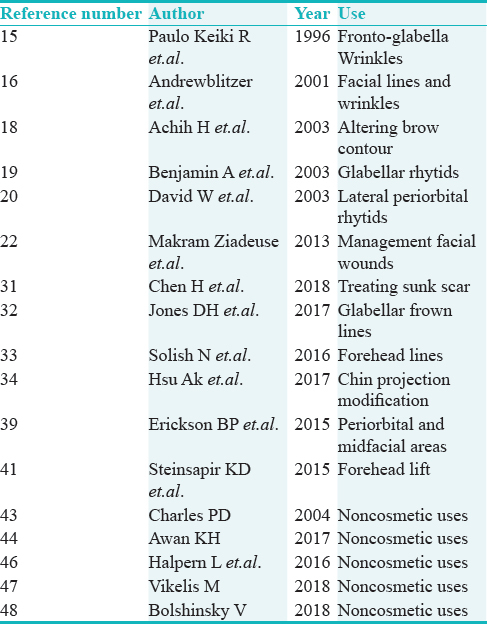 Escalating demand for cosmetic treatment to reduce facial wrinkles and laxity has stimulated the search of published literature for nonsurgical techniques for enhancement of facial beauty. The advancing front in the use of toxins is an emerging science for the beautification of a face. This miracle poison is enormously used nowadays, after the Food and Drug Administration approval in 2002 by the Government of the United States. Botox exploded on to market because of efficacy, tolerability, and minimally invasive nature. The present review gives brief about the history of Botulinum toxin (BT), types, mechanism of action, clinical indications, preparations, storage and technique for various uses with a brief note on patient selection, contraindications, and complications. The review also briefs few published literature on the use of Botox in various facial esthetics procedures. The search using Botox (All Fields) OR OnabotulinumtoxinA (All Fields) AND (“face” [MeSH Terms] OR “face” [All Fields]) AND ([“2015/01/01” (PDAT): “2018/12/31” (PDAT)] AND “humans” [MeSH Terms]) in PubMed search engine from January 2013 to December 2018. We have even activated additional filters such as number of years to recent 5 years, clinical trials, published in English language only with human studies and clinical trials, and reviews have been considered for writing the narrative review. All remaining data excluded from the writing purpose. The finalized articles were downloaded from various sources for reading completely and analyzing the necessary data for extraction and synthesis of narrative review. Various search results have been appended in [Annexure 1 [Additional file 1]] showing references of total 1832. The results have been refined using filter of recent 5 years (2013–2018) period yielded 556 published articles [Annexure 2 [Additional file 2]]. The search further activated additional filters of only English and humans resulted in 325 published articles [Annexure 3 [Additional file 3]]. Later, the search has been restricted to only reviews yielded 120 results [Annexure 4 [Additional file 4]]. We have activated one more additional filter of clinical trials which yielded 51 results [Annexure 5 [Additional file 5]]. All the resulted references and abstracts have been screened for usefulness to write a narrative review was identified. Finally, the search criteria of Botox (All Fields) OR OnabotulinumtoxinA (All Fields) AND (“face” [MeSH Terms] OR “face” [All Fields]) with time duration was activated to find the results [Annexure 6 [Additional file 6]]. Of these final 63 references, the abstract has been read by the team members for suitability of inclusion in the study; and assorted the articles for writing a narrative review. [Table 1] shows references used for writing the review briefly to meet out the criteria set. Out of all search mentioned above references, our team members selected results only related to esthetics and humans; which have been considered to write a narrative review to provide the necessary outlook for the intended users. The advancing front of the use of toxins is an emerging science for the beautification of a face. This miracle poison is enormously used nowadays after the Food and Drug Administration approval in 2002 by the Government of the United States. Botox exploded on to market because of efficacy, tolerability, and minimally invasive nature. The discussion has been divided into history, types of Botox, mechanism of action, clinical scenarios for use, preparation and storage, selection of patients, indications, and contraindications. BT is a powerful neurotoxin produced by bacterium Clostridium botulinum. First time in 1897, it was identified in Belgium by Professor Emile van Ermengem, following the investigation of fatal food poisoning caused by macerated ham consumption. It was named after the disease botulism originally associated sausage meat (Latin-botulus for sausage). There are seven types of Botulinum toxin (A, B, C, D, E, F, and G). Flaccid paralysis of motor and autonomic nerves occur due to classic foodborne disease caused by BT serotypes of A, B, and G. Type B-BT discovered in 1910, and isolation of type A-BT begun in 1920. During the second world war, the research continued at Chemical Warfare Laboratories of Fort Detrick, Maryland in the United Kingdom for biological warfare as a potent neurotoxin (agent ×). In 1989, Ipsen pharmaceuticals bought Porton chemicals and are the only commercially available forms of Botulinum toxin (Dysport)®. Dr. Allen Scott performed a first clinical test in 1978 using type-A BT. His results were published in 1980 led to the extensive use of BT by ophthalmologists for the treatment of blepharospasm. With the advent of BT-A in 1990, effectively launched as nonsurgical esthetic medicine in this modern era. In 1973, a small dosage (35–50 units) of BT-A has been shown to be safe and effective for hyperfunctional lines and facial rhytids. The median lethal dose is considered to be 2500–3000 units which are approximately 100th of the lethal dose. Therefore, BT-A has an extremely high therapeutic index. It is commonly used as a part of overall facial rejuvenation. A myriad of application for BT-A has been explored not only for aging but also for a long list of neuromuscular, glandular disorders, muscular countering, and various pain syndromes. Out of seven serotypes of BT, five are useful in human neuromuscular junction (BT-A, B, E, F, and G). Three types of BT are commercially available. Botox® and Dysport® (both BT type A) and Neuroblock® (BT type B). Allergan produces Dysport® by Ipsen pharmaceuticals and Neuroblock® by Elan, Ireland. Working knowledge of BT-A pharmacology is necessary to understand complications of treatment and contraindications. BT is a polypeptide comprises a protein molecule with a heavy and light chain held together by a heat-labile disulfide bond. Disruption of disulfide bond inactivates the neurotoxin; so BT storage at the correct temperature is necessary., Reconstitution should be carried out carefully to preserve the integrity of both the chains., BT blocks the release of Acetylcholine at the skeletal neuromuscular junction and induces paralysis by inhibiting transmission of a nerve impulse across the synaptic junction to the motor end plate. The chemodenervation results in weakness or classic paralysis.,, The BT heavy chain attaches to the nerve membrane which allows the light chain transportation to its site of action, that is, the protein complex. The light chain enzyme then cleaves the protein specific to the particular neurotoxin. Hence, neuromuscular transmission ceases, and reversibly target muscle atrophies. If the handling of BT is not proper, the fragile bond splits and makes the molecule ineffective. The binding of a molecule is permanent to the motor end plate, and it requires 24–48 h for therapeutic action. This delay is due to the time required to deplete acetylcholine storage in the presynaptic motor end plate. Although binding is permanent paralytic effect persists only for 2–6 months. The reason for this reversal is the reestablishment of neurotransmitter pathway due to new axonal sprouts formation. This neurogenesis process allows complete recovery of transmission pathway which results into the muscle function. BT-B acts on the different cytoplasmic complex. The light chain of BT-B molecule cleaves vesicle-associated membrane protein. BT-B is effective with cervical dystonia and those resistant to BT-A. BT is delivered in an insulated glass vial as 100 units of freeze-dried powder. The manufacturer's guidelines should be followed very strictly to prevent denaturation and maintain a maximum efficacy. The storage before reconstitution either frozen at −5° or in a refrigerator at 2°–8°; once reconstituted must be stored at 2°–8°. If the clinic is not having a refrigerator thermos flask or vaccine transporter can be used. Companies such as Allergan do not recommend this type of storage. Dysport® comes in a plastic hinged box which contains two glass vials. Ipsen recommends the use of Disport® within 8 h and should not be frozen. BT reconstitution should follow the standard aseptic precautions. The product is vacuum sealed, so air can be injected to avoid the rapid constitution. Saline must not be pushed into the vial to prevent agitation of solution mechanically. Rotating of the vial assists the gentle reconstruction. After reconstitution, during transport, cold pack insulation box should be used or else, it should be reconstituted after the journey as agitation denatures toxin and reduces the duration of action. BT injections are used intramuscularly and not subcutaneous unless specifically stated. Injections around dangerous areas require careful analysis of the dose and depth of the injection. Intramuscular placement is essential for maximum effect and control, but in areas like corner of the mouth, subcutaneous treatment can be considered. The dose required for cosmetic use has been discussed and established independently by many researchers based on their experiences,,,,,,,,,,,,,,,,,,, [Table 1]. Review of literature provides more information on dosage preferences by practitioners. BT is potent and very expensive, so each drop must be used cautiously even 0.0125 mL is effective in certain areas. The comparison of the average doses of different BT products for different esthetic purposes showed a significant deviation from accepted 1:1 equivalence coefficients for OnaBTXA: IncoBTXA and 1:2.5 for OnaBTXA: AboBTXA, depending on a particular area of the face. Hence, the clinician can follow national guidelines with their experience during various esthetic procedures. The cosmetologists should have a thorough knowledge of the muscles of the area to be injected. The beginner should mark the injection sites with a washable skin marker. It is important to follow aseptic precautions. During injections, it is vital to avoid nerve, vein, and artery complex in the region of glabella. It is better to know the surface anatomical landmarks such as supraorbital nerves for injection on the glabellar area. The injection in the forehead region usually starts from frontalis zone. During injection, assess the bulk of muscle by asking the patient to frown, then relax and inject at the noted point.,, Do not touch the periosteum, take care to point the needle away from the danger area, avoid pointing toward orbital septum while injecting at the lateral canthus. Sometimes, it is useful to hold the muscle between two fingers in the glabellar area. In lateral orbital skin, spread the skin to observe the orbital veins clearly during injection. Look carefully to avoid superficial veins. Slow insertion during injection significantly reduces the pain perception by minimizing mechanical stimulation., Few authors reconstitute with lidocaine, but the efficacy of BT-A has not been tested. Postinjection, the patient should be asked to press on the site of injection with a tissue which minimizes bruising. If any bruise occurs, an ice pack should be used. Makeup can be used as a camouflage before the patient leaves the hospital. Few believe that ptosis may happen because of untoward diffusion due to flying or lying down after the treatment. Usually, the duration of appointment lasts for a maximum of 10 min excluding counseling visits. It is advisable that nurse may prepare the patient that reduces time spent with the practitioner. During esthetic procedures, it is very much advisable to understand the requirements of patients. Few patients should be assessed thoroughly when they do not have a clear idea of their need and good esthetic sense. They might have motivated because of their friends or parents advice. If this is the situation, the clinician should not commit. The golden rule for the use of Botox is a perceivable pleasure after their expenditure. The patient trust in the clinician will reduce where the patient think their demands has not been met. In such a scenario, it is better for the clinician to refuse the treatment. If the patient is unhappy; the procedure cannot be reversed in a week. Hence, it is essential to listen to the complaint and decide quickly whether the patient can be treated with BT or not. The careful psychological assessment is essential. Spend time with a patient by providing verbal and written information if the patient seems suitable. Always examine the patient closely and discuss likely outcome of the injection. Make sure the patient understands fully, before the patient is taken for injection. The preoperative photography is the must. The clinician should decide before the injection whether alone BT will eliminate or reduce, or prevent further rhytids or any other adjunctive treatments is required. If so, a patient should be conveyed the fact and the outcome. Observe the patient face, neck, and hands while talking and in action. The clinical examination before consideration for injection is as follows: look for a general skin conditions such as sun damage, pigment spots, and tonicity of the skin. The investigation of the cardiovascular system, skin perfusion, and the overall tone is necessary. Brow position, change with expression should be observed. Crow's feet at rest and in motion should be examined along with its extension toward perioral lines when smiling. Hooding should be examined and its disappearance when the patient lifts the brow. All these should be reviewed at rest and in action for successful execution. If the dynamic wrinkles are present with frowning and smile it can be treated. If the patient has wrinkles at rest and sun damage, and elderly patient better to take precautions because it will reduce lines, but will not eliminate them. If it is dynamic, the treatment will be successful but if it is at rest caution, the patient as it may not be eliminated completely. If the patients have a heavy bruise after treatment which may increase medial sagging. Eyebrow and lash distance is an important factor, as it may cause tired appearance if the distance is less. In asymmetrical brows motion, the results of treatment will be asymmetrical. If the frontalis is active, the procedure leads to lateral brow to elevate and creates unattractive peaking of eyebrows. Wrinkles in action are ideal for treatment, but wrinkles at rest may require modification. Wrinkles extending over zygomatic arch will need more care which usually seen in older patients and creates Mickey Mouse appearance. Hooding of lateral eyebrows will remain same even after the treatment which should be explained to the patient that it may require adjunctive therapies. Hypertrophy of the masseter can create a square face of the lower third of the face and convey an impression of heaviness to the face. The square face appearance gives a masculine look. So, many of the female patients wish to reduce the same without surgical intervention. BT provides better noninvasive treatment. The review provided mainly outline and brief about esthetic uses of BT in the maxillofacial area. The knowledge of BT for the clinician is essential to educate the patient and provide insights into esthetic treatment. Increased awareness of esthetics among public, made the necessity for learning and practice of esthetic procedure by a dentist which is increasing because of noninvasive nature of pharmacopeia. BT is becoming boon for the practicing dentist with thorough knowledge of anatomy and indications, contraindications of use of BT successfully without any undue complications. In this review, we have not discussed noncosmetic uses of BT-A which can be read elsewhere in the published literature,,,,, [Table 1]. Contraindications of BT are pregnancy, breastfeeding, neuromuscular junction disorders (myasthenia gravis), amyotrophic lateralizing sclerosis, myopathies, and drug interactions. The success of BT treatment depends on patient satisfaction despite good results. It is better to ask ourselves will this make a patient happy; if not, then better to reassess the patient whether the patient is suitable for BT or not. The patient factors such as identification and avoidance of low intelligence, unreasonable expectations, depression, and dysmorphophobic patients are crucial factors for successful management of esthetic patients. Knowledge of anatomy, proper technique, and exposure for different scenarios of treatment using BT is much essential for successful treatment. Konda D, Thappa DM. Age reversing modalities: An overview. Indian J Dermatol Venereol Leprol 2013;79:3-8. Singh G. Can we prevent skin aging? Indian J Dermatol Venereol Leprol 2009;75:447-51. Ilankovan V. Anatomy of ageing face. Br J Oral Maxillofac Surg 2014;52:195-202. Dastoor SF, Misch CE, Wang HL. Botulinum toxin (Botox) to enhance facial macroesthetics: A literature review. J Oral Implantol 2007;33:167-71. Harmon CB, Hadley ML. A cosmetic approach to cutaneous defects. Atlas Oral Maxillofac Surg Clin North Am 2004;12:141-62. Stupak HD, Maas CS. New procedures in facial plastic surgery using botulinum toxin A. Facial Plast Surg Clin North Am 2003;11:515-20. Jandhyala R. Impact of botulinum toxin a on the quality of life of subjects following treatment of facial lines. J Clin Aesthet Dermatol 2013;6:41-5. Moriarty KC. Botulinum Toxin in Facial Rejuvenation. 1st ed. Spain: Mosby; 2003. Jaspers GW, Pijpe J, Jansma J. The use of botulinum toxin type A in cosmetic facial procedures. Int J Oral Maxillofac Surg 2011;40:127-33. Cartee TV, Monheit GD. An overview of botulinum toxins: Past, present, and future. Clin Plast Surg 2011;38:409-26, vi. Huang W, Foster JA, Rogachefsky AS. Pharmacology of botulinum toxin. J Am Acad Dermatol 2000; 43: 249–50. Lam SM. The basic science of botulinum toxin. Facial Plast Surg Clin North Am 2003;11:431-8. Carruthers A, Carruthers J. Botulinum toxin type A. J Am Acad Dermatol 2005;53:284-90. Niamtu J 3rd. Aesthetic uses of botulinum toxin A. J Oral Maxillofac Surg 1999;57:1228-33. Matsudo PK. Botulinum toxin for correction of fronto-glabella wrinkles: Preliminary evaluation. Aesthetic Plast Surg 1996;20:439-41. Blitzer A, Binder WJ. Current practices in the use of botulinum toxin A in the management of facial lines and wrinkles. Facial Plast Surg Clin North Am 2001;9:395-404. Sarrabayrouse MA. Indications and limitations for the use of botulinum toxin for the treatment of facial wrinkles. Aesthetic Plast Surg 2002;26:233-8. Chen AH, Frankel AS. Altering brow contour with botulinum toxin. Facial Plast Surg Clin North Am 2003;11:457-64. Bassichis BA, Thomas JR. The use of botox to treat glabellar rhytids. Facial Plast Surg Clin North Am 2003;11:453-6. Kim DW, Cundiff J, Toriumi DM. Botulinum toxin A for the treatment of lateral periorbital rhytids. Facial Plast Surg Clin North Am 2003;11:445-51. Zimbler Facsa MS, Nassif PS. Adjunctive applications for botulinum toxin in facial aesthetic surgery. Fac Plast Surg Clin N Am 2003;11:477-82. Ziade M, Domergue S, Batifol D, Jreige R, Sebbane M, Goudot P, et al. Use of botulinum toxin type A to improve treatment of facial wounds: A prospective randomised study. J Plast Reconstr Aesthet Surg 2013;66:209-14. Snider CC, Amalfi AN, Hutchinson LE, Sommer NZ. New insights into the anatomy of the midface musculature and its implications on the nasolabial fold. Aesthetic Plast Surg 2017;41:1083-90. Wu DC, Fabi SG, Goldman MP. Neurotoxins: Current concepts in cosmetic use on the face and neck – Lower face. Plast Reconstr Surg 2015;136:76S-9S. Qaqish C. Botulinum toxin use in the upper face. Atlas Oral Maxillofac Surg Clin North Am 2016;24:95-103. Baumeister JC, Papa G, Foroni F. Deeper than skin deep – The effect of botulinum toxin-A on emotion processing. Toxicon 2016;118:86-90. Nestor M, Ablon G, Pickett A. Key parameters for the use of abobotulinumtoxinA in aesthetics: Onset and duration. Aesthet Surg J 2017;37:S20-31. Miller J, Clarkson E. Botulinum toxin type A: Review and its role in the dental office. Dent Clin North Am 2016;60:509-21. Kordestani R, Small KH, Rohrich RJ. Advancements and refinement in facial neuromodulators. Plast Reconstr Surg 2016;138:803-6. Bertossi D, Mortellaro C, Nocini P. New clinical analysis and device for botox injections. J Craniofac Surg 2016;27:1554-7. Chen H, Pan W, Zhang J, Cheng H, Tan Q. The application of W-plasty combined botox-A injection in treating sunk scar on the face. Medicine (Baltimore) 2018;97:e11427. Jones DH, Kerscher M, Geister T, Hast MA, Weissenberger P. Efficacy of incobotulinumtoxinA for the treatment of glabellar frown lines in male subjects: Post hoc analyses from randomized, double-blind pivotal studies. Dermatol Surg 2017;43 Suppl 2:S235-41. Solish N, Rivers JK, Humphrey S, Muhn C, Somogyi C, Lei X, et al. Efficacy and safety of onabotulinumtoxinA treatment of forehead lines: A multicenter, randomized, dose-ranging controlled trial. Dermatol Surg 2016;42:410-9. Hsu AK, Frankel AS. Modification of chin projection and aesthetics with onabotulinumtoxinA injection. JAMA Facial Plast Surg 2017;19:522-7.
de Almeida AR, Romiti A, Carruthers JD. The facial platysma and its underappreciated role in lower face dynamics and contour. Dermatol Surg 2017;43:1042-9. Zhou R, Pan B, Wang C, Wang D. Mandibular rim trilogy with botulinum toxin injection: Reduction, projection, and lift. Facial Plast Surg 2017;33:102-8. Gart MS, Gutowski KA. Overview of botulinum toxins for aesthetic uses. Clin Plast Surg 2016;43:459-71. Rivers JK, Bertucci V, McGillivray W, Muhn C, Rosen N, Solish N, et al. Subject satisfaction with onabotulinumtoxinA treatment of glabellar and lateral canthal lines using a new patient-reported outcome measure. Dermatol Surg 2015;41:950-9. Erickson BP, Lee WW, Cohen J, Grunebaum LD. The role of neurotoxins in the periorbital and midfacial areas. Facial Plast Surg Clin North Am 2015;23:243-55. Prager W, Nogueira Teixeira D, Leventhal PS. IncobotulinumtoxinA for aesthetic indications: A systematic review of prospective comparative trials. Dermatol Surg 2017;43:959-66. Steinsapir KD, Rootman D, Wulc A, Hwang C. Cosmetic microdroplet botulinum toxin A forehead lift: A new treatment paradigm. Ophthalmic Plast Reconstr Surg 2015;31:263-8. Sharova AA. Comparison of different consensuses of BTXA in different countries. J Cosmet Dermatol 2016;15:540-8. Charles PD. Botulinum neurotoxin serotype A: A clinical update on non-cosmetic uses. Am J Health Syst Pharm 2004;61:S11-23. Awan KH. The therapeutic usage of botulinum toxin (Botox) in non-cosmetic head and neck conditions – An evidence based review. Saudi Pharm J 2017;25:18-24. Zhang EZ, Tan S, Loh I. Botolinum toxin in rhinitis: Literature review and posterior nasal injection in allergic rhinitis. Laryngoscope 2017;127:2447-54. Halpern L, Willis P. Orofacial pain: Pharmacologic paradigms for therapeutic intervention. Dent Clin North Am 2016;60:381-405. Vikelis M, Argyriou AA, Dermitzakis EV, Spingos KC, Makris N, Kararizou E, et al. Sustained onabotulinumtoxinA therapeutic benefits in patients with chronic migraine over 3 years of treatment. J Headache Pain 2018;19:87. Bolshinsky V, Gurland B, Hull TL, Zutshi M. Levator ani syndrome: Transperineal botox injections. Tech Coloproctol 2018;22:465-6.